For the The Frozen Throne faction, see Faceless Ones (Warcraft III). The n'raqi, commonly known as the faceless ones or the faceless, are a monstrous race that arose from the organic matter that seeped from the Old Gods' blighted forms during the primordial era of Azeroth. Cunning and intelligent, they serve their eldritch masters with fanatical loyalty and are known to be virtually unstoppable juggernauts. The faceless ones were first seen serving a forgotten one in the depths of Azjol-Nerub during the events of Warcraft III: The Frozen Throne. They made their first appearance in World of Warcraft with the second expansion, Wrath of the Lich King, and have since become one of the most common sightings in areas influenced by the Old Gods. The faceless ones commanding the aqir under the rule of the Black Empire. When the Old Gods first embedded themselves into Azeroth, they spread their corruptive influence across the landscape. Two distinct races arose from the organic matter seeping from the Old Gods' blighted forms: the n'raqi and the aqir. As the physical manifestations of the Old Gods' will, both served their masters with fanatical loyalty. The n'raqi acted as ruthless taskmasters, employing the aqir as laborers to erect towering citadels and temple cities around ther masters' colossal bulks. The greatest of these bastions were built around the Old God Y'Shaarj. This burgeoning civilization was located near the center of Azeroth's largest continent. As the holdings of Y'Shaarj and the other Old Gods spread across the world, it became known as the Black Empire. Countless eons ago, the n'raqi waged endless wars against each other as part of the forces of N'Zoth, C'Thun and Yogg-Saron. When the Old Gods were sealed below the earth by the titan-forged, many of the n'raqi were imprisoned alongside them. Amid the Scourge's invasion of Azjol-Nerub, many of the kingdom's denizens tunneled underground to escape the Lich King's minions. Yet some of them dug too deep, exposing the tendrils of Yogg-Saron. Rousing its awareness, the Old God sent his n'raqi under the leadership of Herald Volazj against them, and the nerubians were caught between the proverbial rock and a hard place. The nerubians' misfortune costed them the war against the undead, and ultimately, their home. A faceless one from Warcraft III. During the desperate flight of Arthas Menethil and the crypt lord Anub'arak to defend the Lich King from Illidan Stormrage and his armies, the Scourge were forced to make their way through the ancient, underground nerubian kingdom of Azjol-Nerub. At first, the invading undead army preyed only on the pockets of still living Nerubian resistance fighters and dwarves that were left over from Arthas' last journey to Northrend. Yet, as Anub'arak and Arthas journeyed ever deeper into these ruins, they found that the lower regions of the kingdom had become infested by "ancient, horrid things", as the dwarf leader Baelgun had described them, released from the dark below by the earthquakes that were being caused by Illidan's sorcery. These beings appeared as strange, vaguely humanoid creatures, and were accompanied by massive tentacles that seemed to be a part of a single, monstrous entity which Anub'arak referred to as a "forgotten one". The crypt lord seemed to know of these creatures, but was startled to discover they truly existed and warned Arthas to "Look to your defenses, death knight! Fight as you've never fought before!". The two champions of the Lich King and their Scourge forces managed to barely defeat the forgotten one, but as ever more n'raqi emerged from the deeps to stalk the undead army and the caverns began collapsing under the flailing of the massive tentacles, Arthas and Anub'arak were forced to flee from Azjol-Nerub. Eventually, Arthas made it out of fallen kingdom and was able to confront Illidan, but not until making it through the greatest peril he had yet faced. A giant faceless one in the comic. Theramore came under attack from a n'raqi that had been awakened by Cho'gall to take Med'an with him. During the battle, Med'an intuitively wove together arcane and shamanic magic to defeat the ancient creature. In Northrend, multiple faceless ones appear, including Herald Volazj, the leader of the Old Gods' forces, and Darkspeaker R'khem, a captive of the vrykul in the Saronite Mines. N'raqi are also encountered underneath Icecrown Citadel in a place called Naz'anak: The Forgotten Depths. Killing the Faceless Lurkers there is required for the quest  Time to Hide. In Ulduar, the n'raqi are led by General Vezax, a massive faceless general guarding the twisted passages leading to the Prison of Yogg-Saron. New faceless can be found throughout the Abyssal Depths region of Vashj'ir, as well as inside the Throne of the Tides, where they were sent by the Old Gods in order to aid the naga in capturing Neptulon. N'raqi can also be found in others region of Kalimdor and Eastern Kingdoms, such as Darkshore, Ashenvale, the Stonetalon Mountains, Swamp of Sorrows and Twilight Highlands. Erudax serves as boss in Grim Batol and is involved in producing Twilight Hatchlings. The Faceless of the Deep appears in the Lost Isles commanding the naga there against the shipwrecked goblins from Kezan. The goblins, however, believe him to be a deformed naga. During the assault on Wyrmrest Temple, Warlord Zon'ozz and Yor'sahj the Unsleeping appeared in the maws of Go'rath and Shu'ma, respectively. They were ultimately killed by adventurers. The Kirin Tor and the Wardens have kept faceless ones imprisoned in the Violet Hold and the Vault of the Wardens, respectively. During the Burning Legion's third invasion of Azeroth, these n'raqi were set free as a result of the Legion's attacks on these areas. More notably, however, the faceless appear within the Emerald Nightmare under the command of the Nightmare Lord Xavius, providing one of the many indications as to whom the Emerald Nightmare truly belongs. These n'raqi assist Xavius in his battle against the invading adventurers, both assaulting them ahead of his emergence, and keeping his enemies on their toes with their massive, Nightmare-enhanced size. However, even with the aid of these horrors, Xavius is unable to best the adventurers who assault him and is killed. Upon his death the Nightmare dissipates, seemingly forever ending the Old Gods' grip on the realm. Faceless ones are present in both Kul Tiras and Zandalar. N'raqi are vaguely humanoid creatures who, as the name implies, have no discernible faces insofar as other races recognize them. One arm is much larger than the other, grotesque and misshapen, while the other is little more than a prehensile tentacle. A type of underwater n'raqi that, unlike their brethren, have much bigger eyes and nautilus-like heads. A type of n'raqi caster that wear masks and has thinner tentacle arms than other types of n'raqi. C'Thraxxi, or "faceless generals", are massive n'raqi warbringers, larger and more resilient than their lesser brethren. Herald Volazj, a standard n'raqi. A Demented Frostcaller, a n'raqi spellcaster. An Eldritch Horror, a C'Thrax. The n'raqi likely speak the language of the Old Gods, Shath'Yar, which no race on Azeroth is capable of understanding or pronouncing. Their communications are somehow translated directly into the minds of nearby players through telepathic whispers, as evidenced by several powerful n'raqi that were faced by adventurers. Darkspeaker R'khem also communicates with other beings by projecting telepathic thoughts into their mind, together with a wave of soothing, euphoric feelings that are mixed with a sense of pain. After completing [80G3] Mind Tricks, he disappears with a noise that is translated as laughter in the player's mind. Faceless Lurkers sometimes utter "Shur'nab... shur'nab... Yogg-Saron!" when assaulting their victims, which never appears to be accompanied by telepathic whispers, so it seems only powerful n'raqi can express themselves in this manner. [Puddle of Black Liquid] has a chance to drop from Yor'sahj the Unsleeping in Dragon Soul. [Twilight Summoning Portal] has a chance to drop from Cho'gall in the Bastion of Twilight. Zur'aj the Depleted is a rare drop from Twilight Prophet Graeme in Darkshore. Tales say they lived in Azjol-Nerub long before the Scourge came, dwelling too deep for the nerubians to hunt them. The strange faceless ones are ancient monsters long imprisoned beneath the ice and recently loosed again. Faceless ones have a long magical heritage. They draw upon their race's legacy of arcane spellcasting traditions to increase their power. Although faceless ones have a racially low intellect, they have a strong heritage of necromantic magic. A second passage into the Old Kingdom has been discovered by the Scourge, and Baelgun knows the faceless ones will overpower even the undead and then be free to escape into Northrend proper, and so he vows to stop them. Even after the death of a n'raqi, its brain keeps pulsing. During the quest  Surrender or Else!, the Faceless of the Deep claims to remember when the goblin race was created, indicating that they have very long a life span. Much like gnolls or ogres, faceless ones have a "battlecry": "Shur'nab... shur'nab... Yogg-Saron!". Faceless ones are inconsistently classified, with some being considered humanoids and others being aberrations or uncategorized. N'raqi seem to use a jellyfish-like creature as a mount. A concept art image of a faceless one riding a jellyfish can be seen in The Art of World of Warcraft: Cataclysm, as well as on one of the maps of the Throne of the Tides dungeon. 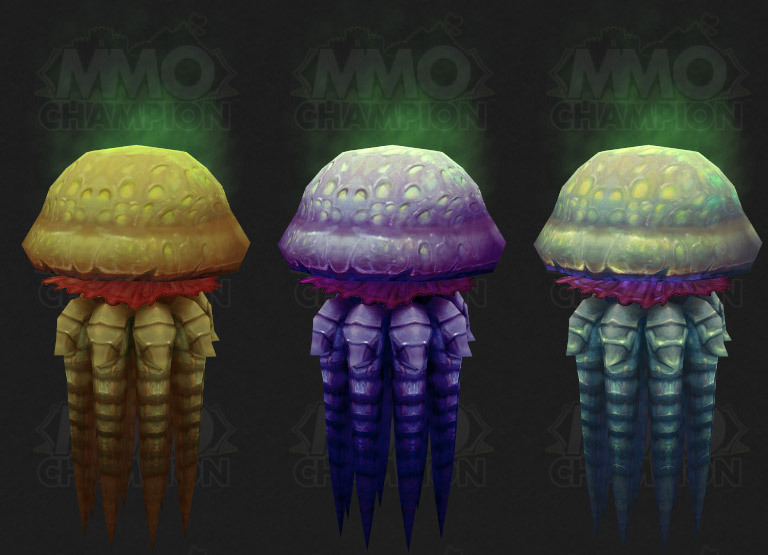 Models of these creatures were added during the early Cataclysm beta, but were not actually used until Legion, when they were used for both the helsquids and the [Fathom Dweller] mount. In The Frozen Throne two subgroups of faceless ones were used: the Faceless Ones and the Unbroken. The name "n'raqi" was first introduced in World of Warcraft: Chronicle Volume 1 in 2016, thirteen years after the faceless ones were first introduced in The Frozen Throne. However, "n'raqi" was not used in-game until Battle for Azeroth introduced mobs such as the N'raqi Eradicators. The updated n'raqi model added in Battle for Azeroth more closely resembles their appearance in Warcraft III than the Wrath of the Lich King model did. The faceless ones may be loosely based on the illithids, or "mind flayers", from Dungeons & Dragons. Both illithids and n'raqi are evil races with an affinity for magic and telepathy, and they have both been described as slimy humanoids with "almost octopus-like heads". Both races also traditionally live underground, and are mostly feared by land-dwellers. It is likely that both creatures are based on H. P. Lovecraft's shared Cthulhu Mythos (which the Old Gods and their minions draw heavy inspiration from), or perhaps more accurately, the Cthulhi, the "Star-Spawn" of Cthulhu. The faceless one mobs in the Old Kingdom are actually called Forgotten Ones, which may suggest a relation to the term forgotten one. The original World of Warcraft n'raqi model prior to World of Warcraft: Battle for Azeroth. The updated n'raqi model introcued in Battle for Azeroth. A n'raqi minion of G'huun. Commander Ulthok, the Festering Prince, in the TCG. A Faceless Behemoth in Hearthstone. Soggoth the Slitherer in Hearthstone. A Spawn of N'Zoth in Hearthstone. A "Flamewreathed Faceless" in Hearthstone. Concept art of a faceless caster riding a jellyfish mount. Patch 5.1.0 (2012-11-27): N'raqi once considered uncategorized are now classified as aberrations.